- says the text for this week's calendar page. by hedwig courts-mahler in memory of the sixtieth anniversary of her death. hedwig courts-mahler. the name is familiar. i came across it again and again in the verneered book shelf that i browsed as a little girl. along with other names and titles who proclaimed promise, love and tragedy in equal measure if preferably not in that order. i also remember my mother's comments... 'och, that stupid woman and her stupid stories' - if not that phrase, then something to a very similar effect. h c-m nonetheless was her mother's best-loved author and so, my granny duly devoured her many writitings, even if all of them were so same. how strange to stumble across this writer again. how strange also to reconsider my granny, as well as my mother's rejection in the light of the quote above. 'fairytales for adults' advertises the publisher; i think of something else as it resonates with a current writing that is being finalised for print in december. here's a mental note to this effect. or should it be: draft? in any case. the little sundew is recovering well after the enforced heat and no water it suffered while i was in iceland. it had died back completely but yesterday morning it was happily munching on a little fruitfly. can you spot it? much of my attention has been revolving around the various 'growing' projects i got myself into this year: the plants inside the house were doing well; a honeysuckle got planted in the backyard along with two marrows. as the usual wet summer onfolded, the marrows got heavily munched on by slugs, so much so that no flowers other than two early ones, pre-slug fest, bore fruits; the honeysuckle got overgrown by the usual weeds in the border and almost fell victim to a sustained attack by our 'gardeners' who ignored long trails and stick and did their best to kill it off - luckily: unsuccessfully so. my avocado plant which in its 20 years has stayed with many friends and has been attended to throughout does not do much more than bristle its dry leaves after three weeks of drought and heat attack. there's no sign of life in it despite the best plant vibes and even more attention by all my visitors and myself since. much of this, notably earlier, living incarnations of the avocado plant, had made it into print. and again, most of my current art projects involve the sounds, cycles and various states of these plants. along with some contemplations of the vagaries of weather, people and all else. none of them are for show just yet. but i can clearly see a picture of an old eccentric woman who talks to her many plants coming along as a possible future. hehehe... it may even be time to plant some fruit trees... in gardens that aren't mine but others. what strange notion property is. i mentioned that i took some laminated drypoint paper with me to iceland, didn't i? having started to put into practice my 'spending time at the print studio plan', i've begun to finalise and edition some of the plates that have accumulated but needed a printing press. so, here are, invariably titled greetings from grimsey; otto helms, grimsey; or: opa uelzen war auch auf grimsey. titling through memorised tool: i took the swiss army knife my dad had rescued and cleaned from one of my, by then rather confused, granddads 'de-cluttering' sessions (aka: throw everything you have in the nearest nettle bushes). while the knife doesn't go everywhere, it made it to iceland and was a rather able tool of choice for some drypoint experiments. and while it's unlikely that he ever would have come along to iceland (travelling was definitely more his wife's thing), i very much enjoyed the thoughts the improvised tool provided for the journey and after. 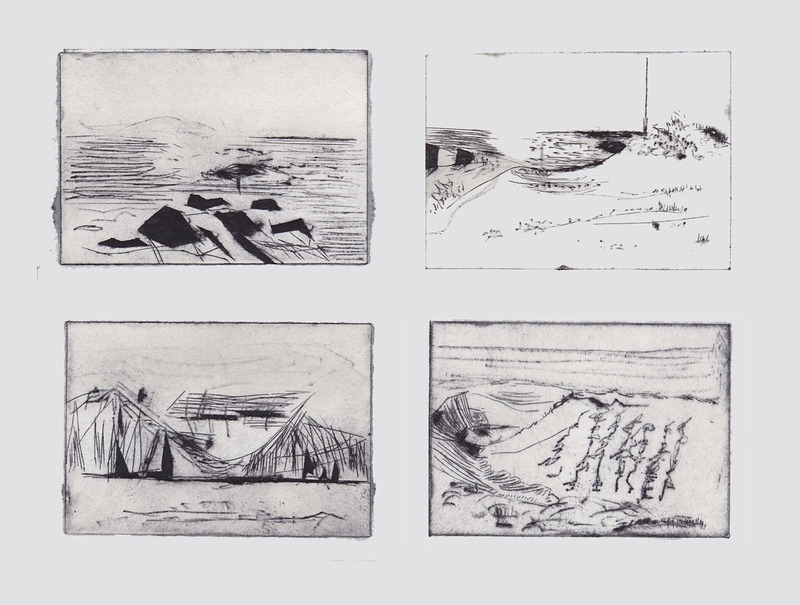 four 'postcards' from the island, inked up as intaglio and printed on one sheet. each card is about 7x10cm. 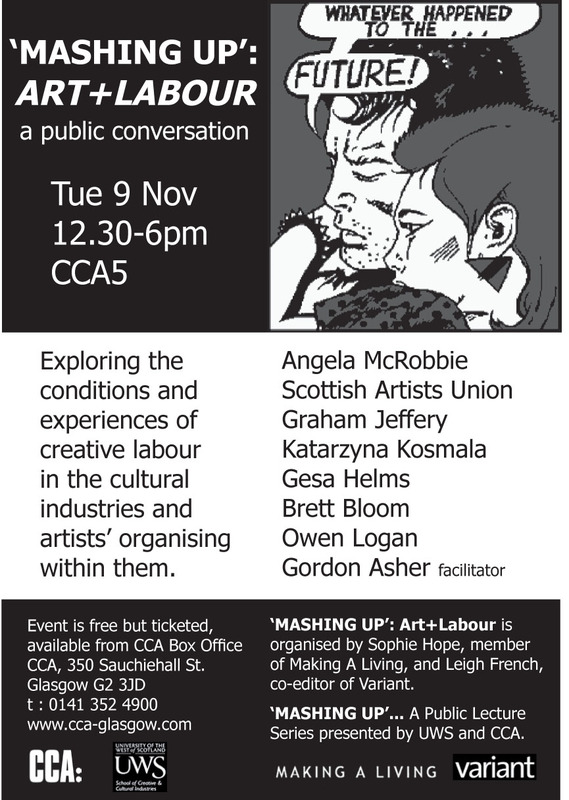 just before, there is another workshop on artist loans and internships in the morning (from 10.30am onwards). please see the variant site for details. now with improved animation and sound that isn't straight out of the recorder (or indeed a location). there is hope yet for a boiling mud pot remix.